Some people's path to anthroposophy leads them directly to Rudolf Steiner's early work and The Philosophy of Freedom, and this becomes the philosophical basis for their future exploration. Rudolf Steiner referred to this as a 'safe' approach. But many people's destiny leads them directly to anthroposophy itself, or via one of its practical initiatives, making it difficult sometimes for them to relate to the cognitive basis of anthroposophy. In this unique study Sergei O. Prokofieff offers fresh means of access to Rudolf Steiner's crucially important book, The Philosophy of Freedom. Prokofieff indicates why The Philosophy of Freedom is so important to anthroposophy. It is here that Rudolf Steiner lays the foundations for his method of research. In Steiner's own words: "One who is willing can indeed find the basic principles of anthroposophy in my Philosophy of Freedom". 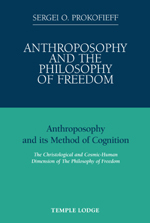 Prokofieff discusses the Christian nature of the anthroposophical method of cognition, and how it is integrally related to freedom and love. This in turn reveals the deeply Christian roots of The Philosophy of Freedom and its importance for modern Christian esotericism. In fact, says Prokofieff, the book holds a 'central position ... in the spiritual history of the Occident'. In considering its multifaceted 'cosmic-human dimension', the author discusses The Philosophy of Freedom in relation to the Mystery of the Resurrection, the Working of the Hierarchies, the Being Anthroposophia, the Fifth Gospel, Rudolf Steiner's Path of Initiation, the Rosicrucian and Michaelic Impulses, the Life Between Death and Rebirth, the Foundation Stone, the Christian Mysteries of Karma and the Science of the Grail. SERGEI O. PROKOFIEFF, born in Moscow in 1954, studied painting and art history at the Moscow School of Art. He encountered anthroposophy in his youth, and soon made the decision to devote his life to it. He has been active as an author and lecturer since 1982, and in 1991 he co-founded the Anthroposophical Society in Russia. In Easter 2001 he became a member of the Executive Council of the General Anthroposophical Society in Dornach. Anthroposophy and The Philosophy of Freedom is his twenty-first book to appear in English translation.